The New York Red Bulls have signed forward and former Homegrown Player Amando Moreno to an MLS contract, the club announced today. Moreno is a product of the Red Bulls Academy and was signed as one of the club's first Homegrown Players in December of 2012 before moving to Club Tijuana in Mexico. "We are pleased to welcome Amando, one of our first Homegrown signings, back to the club," said Red Bulls Sporting Director Denis Hamlett. 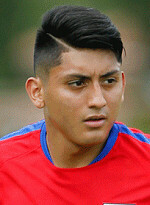 "Amando is a good player that has quality experiences with youth national teams and at the club level. We look forward to having him as part of our team." "We are glad to have Amando back with the organization," said Head Coach Jesse Marsch. "Amando brings speed and good attacking qualities to our team. We look forward to getting him integrated in preseason and seeing how he fits within our group." Moreno signed his first professional contract with the Red Bulls ahead of the 2013 season, and was part of the team that won the Supporters' Shield that year. He made his MLS debut on March 10 in a match at San Jose. Moreno earned a call up to a U.S. National Team camp in May of 2016 under Jurgen Klinsmann, but has not appeared for the senior team. "I'm really happy that I am able to come back to my home team," said Moreno. "I'm grateful to be able to play for the Red Bulls once again. I've always planned on coming back to play here and I'm happy that 2018 is the year I can."